i hope you will join me on sunday, april 25** at the epicurean school of culinary arts in los angeles. i will be teaching a chocolate snob class! we will cover how to have a proper chocolate tasting* and you will learn how to make tantalizing truffles, chocolate ganache orange cake, mexican hot chocolate, german chocolate cocktails, gourmet oreo's, and grilled chocolate sandwiches. the class will be hands on and in depth. don't forget to wear comfy shoes. here is a wonderful write up by vanguard magazine's stevie st. john who attended my last class. you may have to click the image of the article to make it bigger. learn the basics of discovering chocolate through history, terminology, and taste.a brief account will be given on chocolate’s early development to its current production. 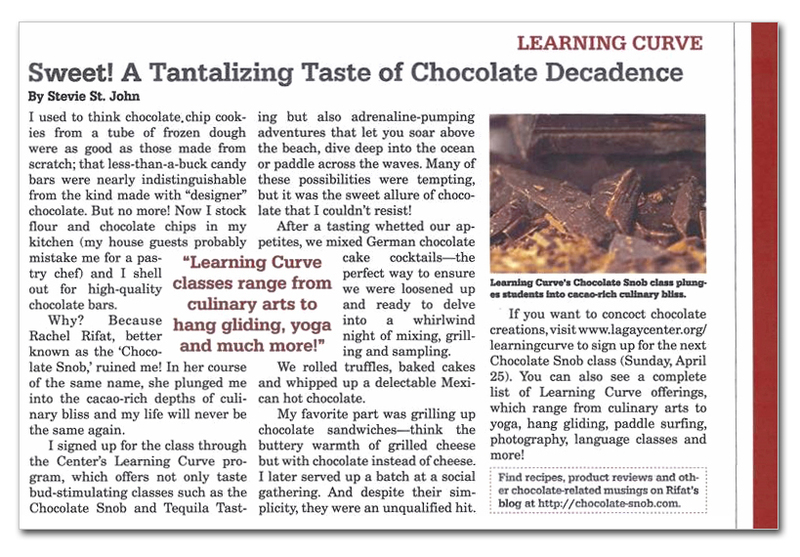 chocolate vernacular will simplify the meaning of cacao and define the importance of percentages. discover some of the finest chocolate from a full tasting using all of the senses. from subtle to unexpected, from texture to aroma, novices will become chocolate connoisseurs by creating their own flavor palettes.